This technology is frequently used when the site has no source of energy other than electricity. Unit capacity will vary from 20 to 2,500 m3 per day. The energy required by the system is provided by compressing the vapour. Approximately 200 mbar are sufficient because it applies to the vapor temperature increase (without any phase change) and provides a Δt that will be enough for evaporation to take place. When starting up, a series of heating elements will be needed to create the initial vapour. In order to reduce electricity consumption, two plate exchangers installed on the seawater inlet recover calories before discharging the distillate and the brine. The electricity consumed by this type of system will vary from 8 to 25 kWh·m–3 evaporated according to the size of the unit. 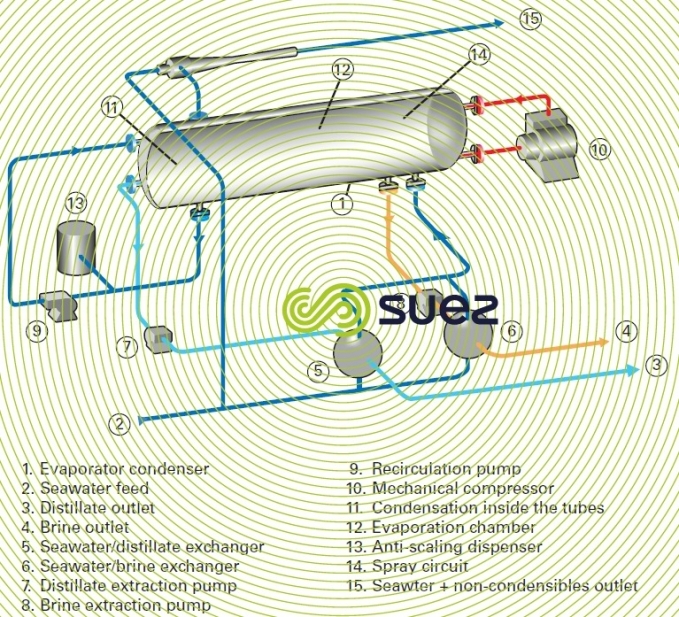 A vacuum is created by a hydro-ejector that either uses pressurised seawater or a separate loop.